The first part of December is behind our backs. Everything around us looks so magical and sparkling! Are you ready to meet Christmas and New Year? Needless to say, the holidays and charming snowflakes are the reasons everyone enjoys winter. What is more, Christmas is not only about decorations. It is about family evenings, warm chats, and long-awaited meeting with friends. During these days we feel like being children again and want to share this happiness with the ones we love. For these simple reasons, winter holidays also mean gifts and presents. It is not a secret that today you can see a lot of people running through the shopping centers… Seeing that, we decided to make a small present for you! As you can see from the article’s name, here we will tell you how to set up a worthy site without coding knowledge. To say more, today we are going to talk about the eCommerce projects. So, would you like to launch a bodacious online shop right now? All in all, Christmas Eve is an ideal time to start your online business because now there are so many people searching for presents. To make a long story short, we are happy to introduce you this stylish list of eCommerce website templates. Who Can Work with These Holiday and Gifts Themes? 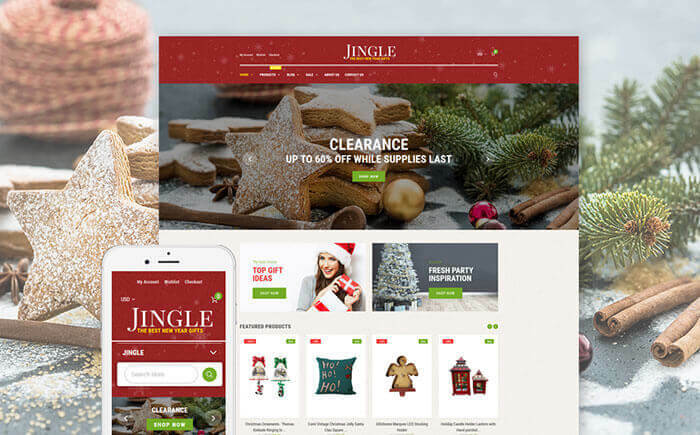 As it has already been mentioned, choosing the introduced holiday and gifts templates, you can create a beautiful and powerful eCommerce site easily. That is why these crisp themes are truly easy-to-use. What is more, they are code-free, so you will have a worry-free customization. In addition, all the handy holiday and gifts themes come with the pre-packed instruction. Using them, you will quickly set up the chosen template. Moreover, these immersive products are feature-rich. Therefore, they have all the functions that are needed for your business niche. Without a doubt, every design element and option is adaptive. It means that your future web shop will fit any device with any screen size. Furthermore, they are also quite editable. As a result, you can tweak all the elements in accordance with your personal taste. 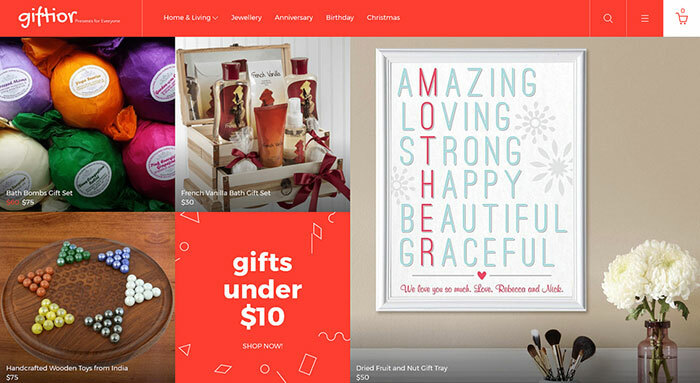 What Are the Features These Attractive Holiday and Gifts Themes Provide You with? To make a long story short, these eye-pleasing holiday and gifts themes provide their owners with multiple modern functions. They are ready-to-use, so you do not need to look for every single feature individually. Below you can see a short list of the options you will have choosing the showcased holiday and gifts templates for your web store. First of all, there is a voguish blog roll that you can add to the design of your shop’s home page. As a result, it will improve your SEO and show people the latest news from your blog. Secondly, there is a smart Theme Color Switcher, which allows one to change the interface of their web shop in a single click! Thirdly, Mega Layout Builder will help you to create the new layouts without coding skills. In addition, there are such gorgeous features as Lazy Load effect and Parallax scrolling that will guide your buyers through the content of the shop in the most winning way. Also, all the hip holiday and gifts themes below include over 500 examples of web typography, so everyone can find there something special. To say more, now you can create the menus of any complicity, create many categories and subcategories and add banners to the menu’s design thanks to a magical MegaMenu. What is more, these ace holiday and gifts themes are multilingual that allows you to sell your goods in several countries. Needless to say, they are also multi-currency, so you can set a price for your product per currency effortlessly. 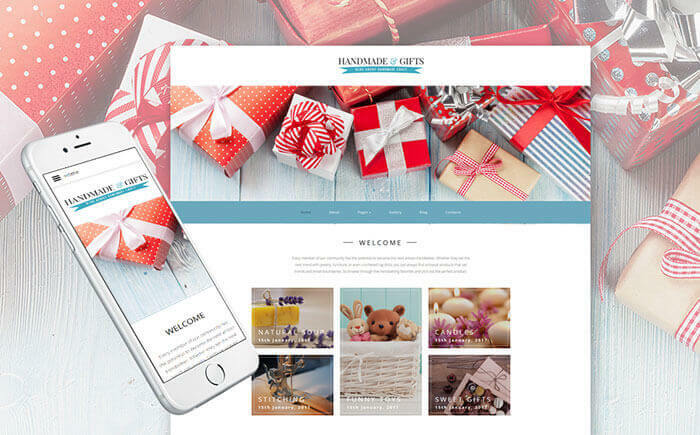 To sum everything up, these top-level holiday and gifts templates allow you to create a prepossessing and fully functional online shop just out-of-the-box. We have added the live demos, so you can check them and see how each template works in action. Have never owned an online shop before? Don’t be afraid and follow your dream. As Pele once said: ‘Success is no accident. It is hard work, perseverance, learning, studying, sacrifice and most of all, love of what you are doing or learning to do.’ Thus, don’t hesitate to experiment with your long-awaited web store. Let’s impress your potential clients with the help of these all-encompassing holiday and gifts themes! P.S. By the way, all the products are from TemplateMonster, so don’t miss their gallery. To begin with, this top-notch holiday and gifts template comes with Ajax Search, which means that your customers will see the live results while they are typing. As a result, the shoppers will find exactly what they were looking for, so this feature will make your eCommerce online project more user-friendly. What is more, Giftior provides its owner with MegaMenu that allows you to present multiple pieces of information creating many categories and subcategories. Initially, this magnificent holiday and gifts theme contains a comfortable Theme Color Switcher, which you can use to change the look of your site just in one click. Given these points, now you can style the online project you build according to your taste with no effort, so you don’t need to have any technical skills. In addition, Handmade and Gifts comes with a brilliant Lazy Load effect, which will both enrich the content of the gallery and make your site load faster. At the outset, this light holiday and gifts template provides your website with an attention-grabbing Parallax effect, so you will quickly charm web audience. To make a long story short, this modern web trend gives your customers the feel of an illusion of depth and motion and surely makes user experience onsite better. What is more, this hip OpenCart theme offers you to present the important information using an easy-to-manage Slider where you can place everything you want to emphasize. As you can see, Jingle’s package includes a high-quality MegaMenu that allows you to construct the menus with multiple categories and subcategories effortlessly. What is more, the feature is code-free as well as the template, so now you can create an impressing online presentation for your business. Furthermore, this astonishing holiday and gifts theme is a multi-currency one, which means that now you can set a price per currency for each of your items. 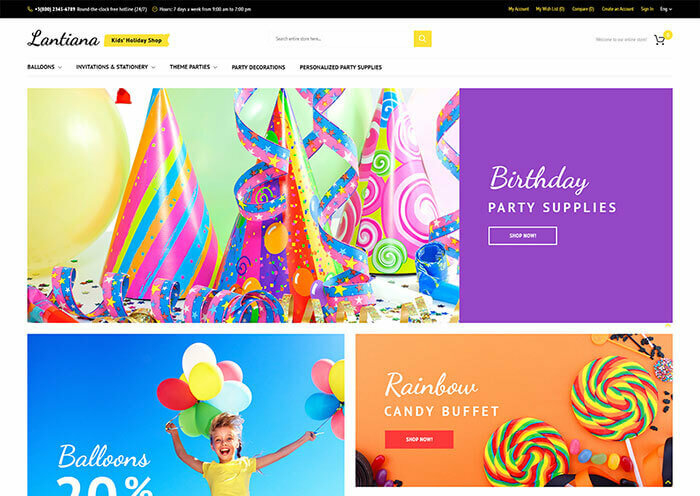 Originally, this bright holiday and gifts theme is highly responsive, so it makes your online project work awesome on any device no matter which screen size it has. Moreover, Jingle offers you to use Special Price Countdown, which lets you set a timer for every individual item and inform people when an offer ends. With it, the guests of your business website will see this smart design element on the home page, so here is an easy way to catch their attention. First of all, with the help of this stylish holiday and gifts theme, you can introduce the product you want to highlight without trouble, as there is Featured Products option. What is more, Classygift additionally allows your customers to create the voguish collections of your goods that they can share via social media with friends and followers. Also, the product below features cool maps that will show the potential shoppers where your shops are and help people to find the most convenient ways to them. Naturally, Wishlist is a real must-have for every professionally manages online shop, so the immersive Holiday and Gifts theme below provides you with this feature. What is more, Giftior contains a strong Compare plugin that you can use to improve the work of your web store without coding skills. With its help, the guests of your online project will be able to compare the needed products immediately and find the very item rapidly. Without a doubt, Deluxe Card is an advantageous way to make an online promotion for your products, as using the sweet Product Badges, you can easily highlight the new goods or the ones that have some discounts. To make a long story short, this feature-rich holiday and gifts template provides its owner with a soft design, which was created especially for a professional online shop related to cards. What is more, Deluxe Card has a powerful Wishlist where the customers can save the items they would like to buy, and a wonderful Ajax functionality. 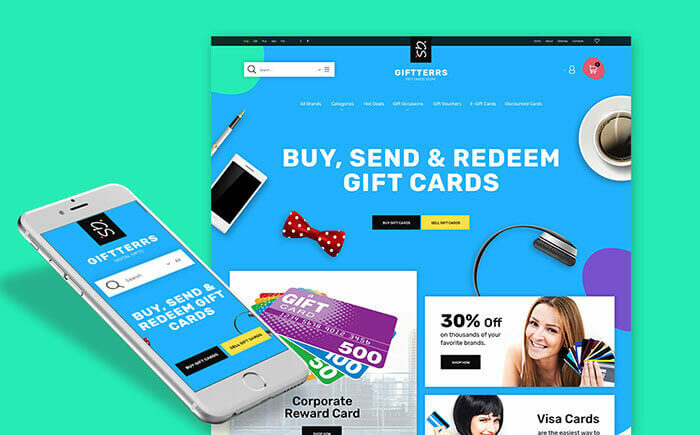 To start with, supplied with Mega Layout builder, Giftterrs is a fully editable holiday and gifts PrestaShop theme, which provides its owner with 3 different pre-made layouts. That is why, using this skillfully designed template, you can construct the new online pages, styles them the way you need, and even use the ready-made layouts for your adorable web shop. Furthermore, with the help of Giftterrs, your clients will not waste their time on registration because now they are able to login via social networks or TM header account. And now it is time to view out this gorgeous and quick OpenCart product, which allows you to launch a worthy flower online store without experience and do it at the drop of a hat! 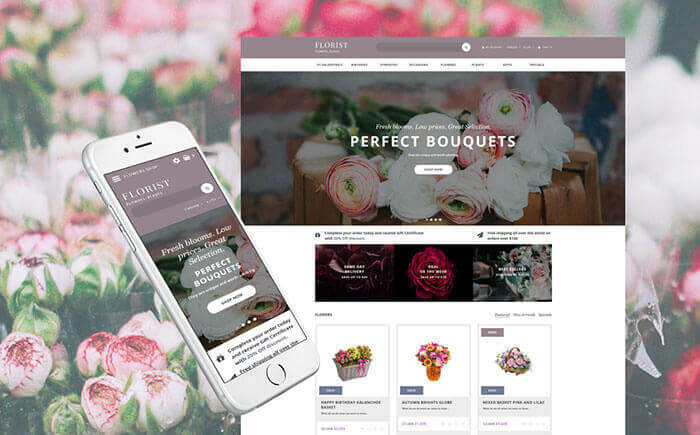 Being multilanguage, Florist is a mobile-friendly and multi-currency OpenCart theme, which offers you to build an international web shop. What is more, the gorgeous theme below has an interactive blog, which you can design up to your taste and display on the home page. At the outset, being RTL-ready, Fireamax is a bodacious holiday and gifts theme, which will surely enlarge your auditory, as there are so many shoppers reading right to left! To say more, this top-grade template comes with the amazing Color Skins and a rich variety of web typography’s examples that are truly editable. In the end, choosing Fireamax means that your online shop will be noticeable for the search engines thanks to a powerful SEO integration. The first thing you should know about this unforgettable holiday and gifts MotoCMS template features Presets Builder that lets you modify your widgets with the help of a rich multiplicity of highly changeable presets. To say more, there is a smart Drag-and-Drop Editor that will help you to construct various content elements and cool sections for your online shop. To finish with, Jingle Bells provides you with such gallery types as media, carousel, and grid, so you can showcase the goods in all their glory! Needless to say, TM Products Slider will help you to introduce the content of your web store professionally and right on the home page. What is more, using this adaptive holiday and gifts template you can build a filterable gallery and your buyers will be able to pick exactly what they are looking for. For these simple reasons, Alleando contains a lot of fitter options, so you can sort everything by color, designer, size, price, date, and much more. In a word, Gifts is a ready-made eCommerce solution for everyone, who dreams about a dazzling online store, introducing their holiday and gifts related business. 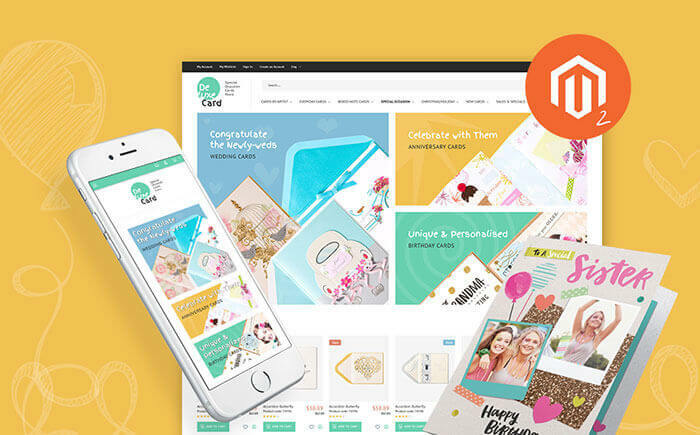 That is why, this all-encompassing OpenCart template allows you to publish many colorful banners and filter the items using as many categories and subcategories as you need. Moreover, opening your online project, the users will see a minimalist note about email subscription, so they will receive all the news about sales, bonuses, new products, etc. swiftly. 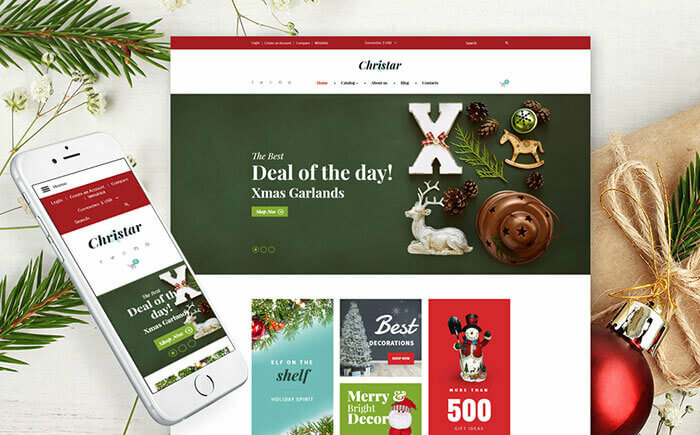 Unquestionably, thanks to Christar, your online shop will reach an all-time high, as this striking holiday and gifts theme has a well-commented code and 100% SEO readiness. Before all else, this VirtueMart template allows you changing currency right on the top of your front page to make the web shop international. What is more, this well-featured theme has a small quick contact form, so the visitors of your online pages will be able to ask their questions and get the needed information immediately. 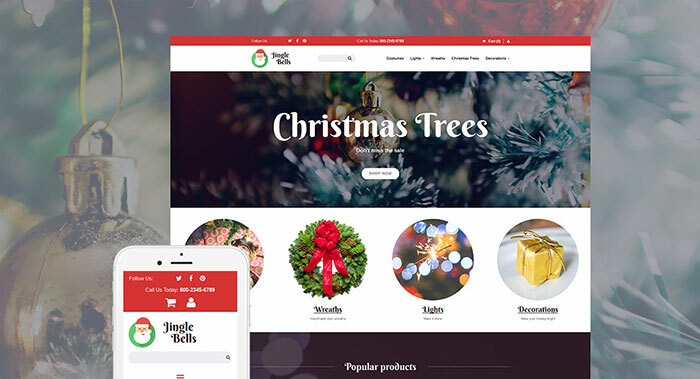 Shortly, from this moment shopping will be a pleasant time for your clients because this innovative holiday and gifts template includes Smart Product Labels and Ajax Catalog filter that will make your shop’s navigation more comfortable. What is more, Lantiana has Social Login option allowing the buyers to enter your website using the social media accounts. In addition, this ace Magento theme provides its owner with TM Ajax Search, which shows the live results when a person is typing, so your visitors will see the products that are popular now. Would you like to find a first-string holiday and gifts template, which contains 40+ unusual animations and Parallax scrolling to create a voguish online shop just out-of-the-box? For these simple reasons, don’t miss this unmatched MotoCMS theme that has an easy in use Admin Panel and provides you with a worry-free customizing. 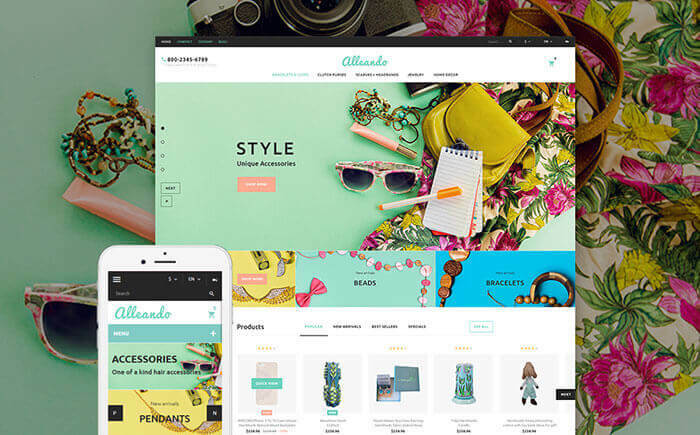 What is more, Alleando is a versatile product, which means that your trendy online shop will look and work magically in any browser and on any device with any screen. 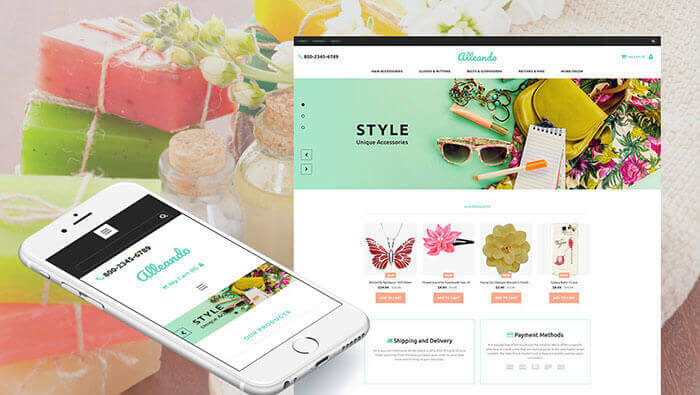 Undeniably, Florabido is an outstanding holiday and gifts PrestaShop theme, which provides your online shop with all the must-have options, design elements, and settings. For example, there is a pre-built Ajax Cart that lets your shoppers add and remove the items to / from the cart without trouble, so they do not need to wait until the page reloads. Moreover, you have a possibility to create a modern appearance for your eCommerce site easily thanks to Product Carousel and a stylish blog roll, which you can display on the home page. Obviously, this new-gen holiday and gifts PrestaShop template features Crossbrowser Compatibility, so its lovely design will always work professionally, no matter which browser it is viewed on. Furthermore, there are a lot of TM Modules that help one to set up a fast and fully featured web store without losing a mint of money and without coding experience. To say more, Pink Flora provides you with step-by-step documentation that will help you to install and manage the template. 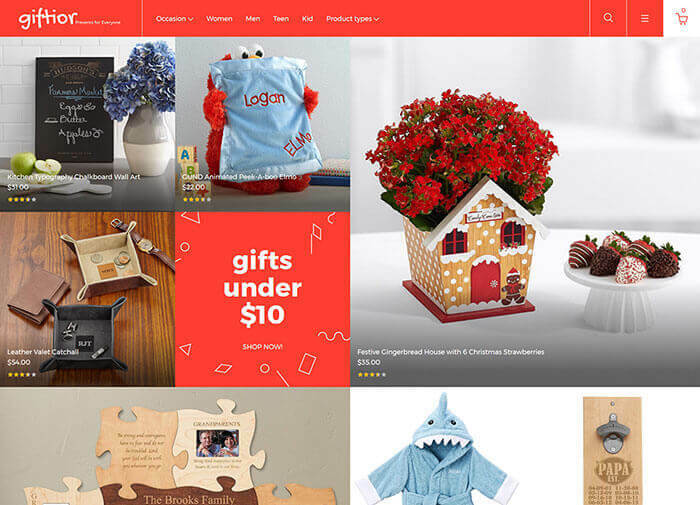 To end with, let’s move to this novice-friendly holiday and gifts OpenCart theme that will help you to create a multilanguage and mobile-friendly online shop with a truly responsive design. Moreover it contains Stick-to-Top Menu, which means that your menu will stick to the top of the page and will not disappear when a user scrolls down. To summarize, Surprise conforms to the recent web design standards and helps to amplify your brand and obtain new clients from all over the globe. As you can see, these were all the 20 beautiful holiday and gifts templates. All of them are highly responsive and have a valid, semantic, and well-commented code. To say more, there is a truly powerful SEO integration. As a result, your online shop will have higher results from Google, Yahoo, Bing, and other search engines. Needless to say, using the innovative holiday and gifts themes below, you are able to launch a high-quality online project effortlessly. What is more, you can even make it multilingual and set a price per currency for every product individually. Another must-have these templates provide you with is Ajax functionality. Without a doubt, a popular site means a comfortable site. And we all hate these long page reloads… In a word, now you know how to set up a magnificent web shop without coding knowledge. Therefore, don’t hesitate to realize your dreams and become the owner of a trendy and strong eCommerce project using these ready-to-use holiday and gifts themes!